If you’re in the restaurant industry, you know the first rule of success: you’re not throwing a dinner party; you’re running a business that makes money. Just consider the immense overhead and labor that goes into running a successful restaurant. You need to be strategic if you want to survive, much less thrive. Costs and Operations are critical to maximize profits. The first and best place to start maximizing profit is with the tactical design of your menu. The average time spent on a menu is just over 100 seconds. 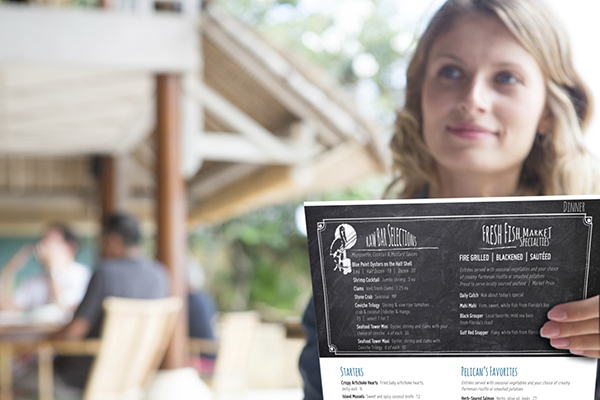 Your menu should not be any bigger than necessary or customers get overwhelmed. 2. Dollar signs don’t help. The Center for Hospitality Research found that if a dollar sign is used in the price, customers are more likely to go for cheaper options. Don’t just list them straight down the side in a column or customers will simply look for the lowest prices. 4. Strategically place high margin items. On a two-page menu, studies show customers will look center right and then at the first and last items listed. On a one-page menu, the eye is naturally drawn to the upper right hand corner and then to the center. 5. Use boxed or call-out sections. This is a clever technique given #4 and one very commonly used. Try to stop your eye from wandering to a well-placed boxed-in description of your favorite restaurant’s signature (and most profitable) dish. Keep dessert off the main menu because diners tend to skip appetizers if they see dessert. With a separate dessert menu, you can capture all three buying options, appetizer, entrée, dessert. Here are just 6 tips to get you started on reorganizing your menu. There are so many more tips for running a profitable restaurant! Check out our 5 Tips for Restaurant Branding. Go ahead and leave a comment with what you have found in your restaurant to be the key to your restaurant menu design. And if you would like more secret tips, click below to send us your email!